One thing is for sure, we will need sustenance to get through this. Maybe time to make a bowl of these spiced nuts…. This entry was posted in Blogging and tagged bald eagles, hornby island, phoenix the baby eagle chick, spiced nuts on 06/05/2010 by Joanna. Isn’t little Phoenix getting big? The first thing I do when I get up in the mornings is check in on how they’re going. It amazes me how deft the mother is at feeding the chick – it’s hard to get exactly the rise sized piece to feed when your only implement is your beak! 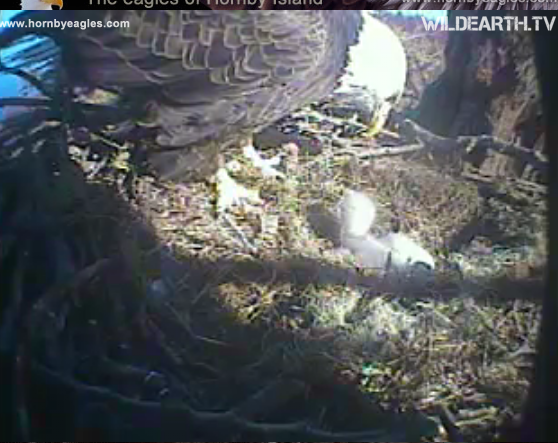 The clarity of the webcam is astonishing – you can see small insects flying around the nest! I think the sound pick up is pretty amazing too! Such a squeaky baby!